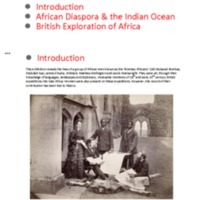 London Borough of Newham Council led “The Wickedest of Cargoes…”, an exhibition at Stratford Town Hall, which used local museum and archive collections to explore the history of the slave trade and abolition. 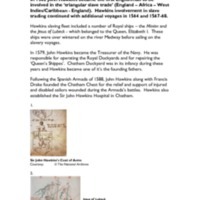 It looked at the history of slavery through different societies and cultures, and especially the Barbary pirates who enslaved seamen and passengers from ships on the west coast of North Africa. 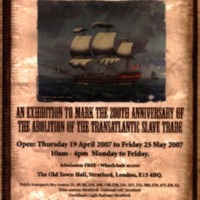 The exhibition explored the transatlantic slave trade and its abolition from a local perspective, focusing on the large Quaker community in West Ham and, in particular, John Fothergill and Samuel Gurney. 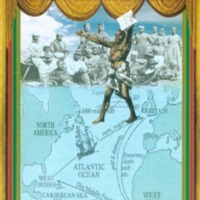 Newham has many residents from an African Caribbean background, who were consulted in the development of the exhibition. Addressing the legacies of slavery, the exhibition looked at the rising Black population of the borough through history and the importance of the Coloured Men’s Institute in Canning Town, set up as a place where Black families could meet.